"Harold Alexander" redirects here. For other uses, see Harold Alexander (disambiguation). Field Marshal Harold Rupert Leofric George Alexander, 1st Earl Alexander of Tunis, KG, GCB, OM, GCMG, CSI, DSO, MC, CD, PC (10 December 1891 – 16 June 1969), was a senior British Army officer who served with distinction in both the First World War and the Second World War and, afterwards, as Governor General of Canada, the 17th since Canadian Confederation. Alexander was born in London, England, to aristocratic parents and was educated at Harrow before moving on to the Royal Military College, Sandhurst, for training as an army officer of the Irish Guards. He rose to prominence through his service in the First World War, receiving numerous honours and decorations, and continued his military career through various British campaigns across Europe and Asia. In World War II, Alexander oversaw the final stages of the Allied evacuation from Dunkirk and subsequently held high-ranking field commands in Burma, North Africa and Italy, including serving as Commander-in-Chief Middle East and commanding the 18th Army Group in Tunisia. 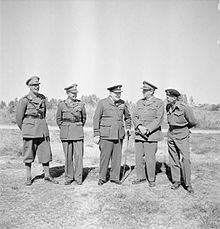 He then commanded the 15th Army Group for the capture of Sicily and again in Italy before receiving his field marshal's baton and being made Supreme Allied Commander Mediterranean. In 1946 he was appointed as governor general by King George VI, on the recommendation of Prime Minister of Canada William Lyon Mackenzie King, to replace the Earl of Athlone as viceroy, and he occupied the post until succeeded by Vincent Massey in 1952. Alexander proved to be enthusiastic about the Canadian wilderness and was a popular governor general with Canadians. He was the last non-Canadian-born governor general before the appointment of Adrienne Clarkson in 1999, as well as the last governor general to be a peer. After the end of his viceregal tenure, Alexander was sworn into the Queen's Privy Council for Canada and thereafter, in order to serve as the British Minister of Defence in the Cabinet of Winston Churchill, into the Imperial Privy Council. Alexander retired in 1954 and died in 1969. Alexander was born in London into an aristocratic family from County Tyrone of Ulster-Scots descent. He was the third son of James Alexander, 4th Earl of Caledon, and the Countess of Caledon, a daughter of the 3rd Earl of Norbury. Alexander was educated at Hawtreys and Harrow School, there participating as the 11th batsman in the sensational Fowler's Match against Eton College in 1910. Though Alexander toyed with the notion of becoming an artist, he went instead on to the Royal Military College, Sandhurst. In September 1911, Alexander entered the Royal Military College, Sandhurst, and was commissioned as a second lieutenant in the British Army's Irish Guards. He was promoted to lieutenant in December 1912. Alexander spent most of the First World War on the Western Front. As a 22-year-old platoon commander in the 1st Battalion, Irish Guards, he served with the British Expeditionary Force (BEF) in 1914. He took part in the retreat from Mons and was wounded at First Ypres and invalided home. He was promoted to temporary captain on 15 November 1914 and permanent captain in the newly raised 2nd Battalion on 7 February the following year. Alexander returned to the Western Front in August 1915, fought at the Battle of Loos and was, for ten days in October 1915, an acting major and acting Commanding Officer (CO) of the 1st Battalion, Irish Guards as a "Battle Casualty Replacement". He then returned to the 2nd Battalion as a company officer and, in January 1916, received the Military Cross for his bravery at Loos. For service in the Battle of the Somme on 15 September 1916, he was, in October, appointed to the Distinguished Service Order (DSO), the citation for which read: "For conspicuous gallantry in action. He was the life and soul of the attack, and throughout the day led forward not only his own men but men of all regiments. He held the trenches gained in spite of heavy machine gun fire." In the same month, Alexander was further honoured with induction into the French Légion d'honneur. On 10 December 1916, his twenty-fifth birthday, Alexander became second-in-command (2-i-c) of the 1st Battalion, Irish Guards as an acting major. By May, he was briefly acting CO of the 1st Battalion, as an acting lieutenant colonel, while still only a substantive captain. He became a permanent major on 1 August 1917 and was again promoted acting lieutenant colonel, this time confirmed as CO of the 2nd Battalion, Irish Guards, on 15 October. Alexander commanded his battalion at Third Ypres, where he was slightly wounded, then at Bourlon Wood (part of the battle of Cambrai), where his battalion suffered 320 casualties out of 400 men. Alexander, between 23 and 30 March 1918, had to assume command of the 4th Guards Brigade, during the British retreat from the German Army's Spring Offensive. He once again commanded the 2nd Battalion, Irish Guards at Hazebrouck in April 1918, where it took such severe casualties that it saw no further action. Still an acting lieutenant colonel, he then commanded a corps infantry school in October 1918, a month before the war ended on 11 November 1918. Rudyard Kipling, who wrote a history of the Irish Guards, in which his own son, Jack Kipling, fought and was killed in action, noted that, "it is undeniable that Colonel Alexander had the gift of handling the men on the lines to which they most readily responded... His subordinates loved him, even when he fell upon them blisteringly for their shortcomings; and his men were all his own." Alexander in 1919 served with the Allied Control Commission in Poland. As a temporary lieutenant-colonel, he led the Baltic German Landeswehr in the Latvian War of Independence, commanding units loyal to Latvia in the successful drive to eject the Bolsheviks from Latgalia. During service there, he was accidentally wounded by one of his own sentries on 9 October 1919. Alexander returned to Britain in May 1920 as a major, second in command of the 1st Battalion, Irish Guards; in May 1922, he was promoted substantive lieutenant-colonel and appointed commanding officer. He commanded the battalion at Constantinople (a sensitive posting in the runup to the Chanak Crisis), then Gibraltar from October 1922, then in London from April 1923 until January 1926, when he was released from that role to attend Staff College, Camberley. Alexander was then in February 1928 promoted to colonel (backdated to 14 May 1926) and was the next month appointed Officer Commanding the Irish Guards Regimental District and 140th (4th London) Infantry Brigade, part of 47th (1/2nd London) Division, in the Territorial Army a post he held until January 1930, when he again returned to study, attending the Imperial Defence College for one year. There, two of Alexander's instructors—the future field marshals Alan Brooke and Bernard Montgomery—were unimpressed by him. After the completion of his courses, Alexander, on 14 October 1931, married Lady Margaret Bingham, the daughter of the Earl of Lucan and with whom Alexander had two sons—Shane, born 1935, and Brian, born 1939—and a daughter, as well as adopting another daughter during his time as Canada's governor general. Alexander then held staff appointments as (from January 1931) GSO2 in the Directorate of Military Training at the War Office and (1932–34) GSO1 at HQ Northern Command in York, before being made in October 1934 a temporary brigadier and given command of the Nowshera Brigade, on the Northwest Frontier in India. For his service there, and in particular for his actions in the Loe-Agra operations against the Pathans in Malakand between February and April 1935, Alexander was that year made a Companion of the Order of the Star of India and was mentioned in dispatches. He was mentioned once more for his service during the Second Mohmand Campaign in Northwest Frontier Province from August to October of the same year, serving under Brigadier Claude Auchinleck. Alexander had a reputation for leading from the front and for reaching mountain crests with or even ahead of his troops. In March 1937, Alexander was appointed as one of the aides-de-camp to the recently acceded King George VI and in May returned to the United Kingdom to take part in this capacity in the state procession through London during the King's coronation. Alexander would have been seen in this event by two of his Canadian viceregal successors: Vincent Massey, who was then the Canadian high commissioner to the United Kingdom, and Massey's secretary, Georges Vanier, who watched the procession from the roof of Canada House on Trafalgar Square. Following the coronation celebration, Alexander returned to India, where he was made the honorary colonel of the 3rd Battalion, 2nd Punjab Regiment, and then in October 1937 was promoted to the rank of major-general, making Alexander the youngest general in the British Army. He relinquished command of his brigade in January 1938, and in February returned to the United Kingdom to take command of the 1st Infantry Division. In June 1938 he was appointed a Companion of the Order of the Bath. Following the outbreak of the Second World War, in September 1939, Alexander brought the 1st Division to France, where it became part of the British Expeditionary Force (BEF) and served there for the next eight months. In May 1940, when the German Army invaded France, he successfully led the division's withdrawal to Dunkirk, where it was evacuated to England, along with the rest of the BEF. Shortly after Major General Bernard Montgomery had been appointed to command II Corps (and before that the 3rd Division), Alexander was, while still on the beachhead, placed in command of I Corps, and left the beach on the last destroyer on 3 June after ensuring that all British troops had been evacuated. In recognition of his services in the field from March to June 1940, Alexander was again mentioned in despatches. After Dunkirk, Alexander returned to the United Kingdom and continued to command I Corps, now guarding the coasts of Yorkshire and Lincolnshire. He was promoted acting lieutenant-general in July 1940, and appointed the General Officer Commanding-in-Chief (GOC-in-C) of Southern Command, which was responsible for the defence of south-west England. His rank of lieutenant-general was made permanent in December 1940. On 1 January 1942 he was knighted and appointed a Knight Commander of the Order of the Bath, and in February, after the Japanese invasion of Burma, was sent to India to become GOC-in-C of British Forces in Burma as a full general. Alexander was unable to fulfil his orders to hold Rangoon, which was abandoned on 6–7 March. He took personal charge of some small local engagements, and was encircled by the Japanese troops in the Battle of Yenangyaung. Rescued by Chinese troops commanded by General Sun Li-jen, Alexander was able to escape. Following that, Alexander increasingly left much of the tactical conduct of the campaign to his corps commander, Lieutenant-General William Slim, while he himself handled the more political aspects of relations with Joseph Stilwell, the nominal commander of the Chinese forces. Alexander was promoted to Commander-in-Chief (C-in-C) of Allied Land Forces in Burma, March 1942, and ordered Slim to abandon Mandalay and retreat to India. By July 1942, the British and Indian forces in Burma had completed their fighting retreat into India, and Alexander, having yet again been mentioned in despatches for his Burma service, was recalled to the United Kingdom. 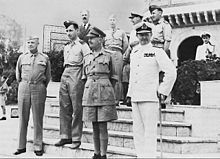 He was at first selected to command the British First Army, which was to take part in Operation Torch, the Anglo-American invasion of French North Africa. However, following a visit in early August to Egypt by the British Prime Minister, Winston Churchill, and the Chief of the Imperial General Staff (CIGS), General Sir Alan Brooke, Alexander flew to Cairo on 8 August to replace General Claude Auchinleck as C-in-C of Middle East Command, the post responsible for the overall conduct of the campaign in the desert of North Africa. At the same time, Lieutenant-General Montgomery replaced Auchinleck as GOC of the British Eighth Army. Alexander presided over Montgomery's victory at the Second Battle of El Alamein and the advance of the Eighth Army to Tripoli, for which Alexander was elevated to a Knight Grand Cross of the Order of the Bath, and, after the Anglo-American forces of the First Army (under Lieutenant-General Kenneth Anderson) from Operation Torch and the Eighth Army converged in Tunisia in February 1943, they were brought under the unified command of a newly formed 18th Army Group headquarters, commanded by Alexander and reporting to General Dwight D. Eisenhower, the Supreme Allied Commander in the Mediterranean Theater of Operations (MTO) at Allied Forces Headquarters (AFHQ). The American General Omar Bradley, who fought in the Tunisian Campaign, then commanding the U.S. II Corps, credited Alexander's patience and experience with helping an inexperienced United States "field command mature and eventually come of age." The Axis forces in Tunisia surrendered by May 1943, and Alexander's command became the 15th Army Group, which was, under General Eisenhower, responsible for mounting in July the Allied invasion of Sicily, again seeing Alexander controlling two field armies: General Montgomery's Eighth Army and Lieutenant General George S. Patton's U.S. Seventh Army. After Sicily, and in preparation for the Allied invasion of Italy, the Seventh Army headquarters were replaced by those of the U.S. Fifth Army, led by Lieutenant General Mark W. Clark. Field Marshal Sir Harold Alexander, pictured here as Supreme Allied Commander of the Mediterranean Forces, at his Headquarters in the Palace of Caserta, Italy. When Eisenhower was appointed Supreme Allied Commander for the planned Normandy landings he suggested that Alexander become ground forces commander, as he was popular with both British and American officers. Bradley, who after Normandy commanded the U.S. 12th Army Group, remarked that he would have preferred to work with Alexander, rather than Montgomery, as he regarded the former as "a restrained, self-effacive and punctilious soldier". Of the problems that subsequently surfaced with Montgomery's command of the Anglo-Canadian 21st Army Group, Bradley suspected they would not have occurred with Alexander in command. Brooke, however, applied pressure to keep Alexander in Italy, considering him unfit for the assignment in France. Thus, Alexander remained in command of the 15th Army Group, and, with the support of numerous Allied commanders, controversially authorised the bombing of the historic abbey at Monte Cassino, which resulted in little advance on the German Winter Line defences. It was not until the fourth attempt that the Winter Line was breached by the Allies, and Alexander's forces moved on to capture Rome in June 1944, thereby achieving one of the strategic goals of the Italian Campaign. However, the U.S. VI Corps in the Anzio beachhead, under Clark's orders, failed to follow their original break-out plan that would have trapped the German 10th Army escaping northwards in the aftermath of the Battle of Monte Cassino, instead favouring an early and highly publicised entry into Rome two days before the Allied landings in Normandy. Alexander remained in command of the 15th Army Group, as well as its successor, the Allied Armies in Italy (AAI), for most of the Italian Campaign, until December 1944, when he relinquished his command to Clark and took over as the Supreme Commander of the Allied Forces Headquarters, responsible for all military operations in the Mediterranean Theatre. Alexander was concurrently promoted to the rank of field marshal, though this was backdated to the fall of Rome on 4 June 1944, so that Alexander would once again be senior to Montgomery, who had himself been made a field marshal on 1 September 1944, after the end of the Battle of Normandy. Alexander then received the German surrender in Italy, on 29 April 1945. Further, as a reward for his leadership in North Africa and Italy, Alexander, along with a number of other prominent British Second World War military leaders, was elevated to the peerage on 1 March 1946 by King George VI; he was created Viscount Alexander of Tunis and Errigal in the County of Donegal. Brooke felt that Alexander needed an able chief of staff "to think for him", while Montgomery (Alexander's subordinate in Africa and Italy) claimed to think of Alexander as "incompetent" and success was attained in Tunisia only because Montgomery lent Lieutenant-General Brian Horrocks, the commander of IX Corps, to organise the coup de grace. However, Harold Macmillan was impressed by Alexander's calm and style, conducting dinners in his mess like those at an Oxbridge high table, discussing architecture and the campaigns of Belisarius, rather than the current war. Macmillan thought Alexander's urbane manner and willingness to discuss and compromise were a sensible way to maintain inter-Allied cooperation, but Alexander's reserve was such that some thought him empty of strategic ideas and unable to make decisions. [n 1] Graham and Bidwell, however, wrote that Alexander's impenetrable reserve made it hard to judge whether or not he had any military ideas, but that he was "unable or unwilling" to assert his will over his army commanders, and that Mark Clark, who often referred to him scornfully as a "peanut" and a "feather duster", exploited this weakness. With the cessation of hostilities, Alexander was under serious consideration for appointment to the post of Chief of the Imperial General Staff, the British Army's most senior position beneath the sovereign. He was invited, though, by Canadian prime minister William Lyon Mackenzie King to be his recommendation to the King for the post of Governor General of Canada. Alexander thus chose to retire from the army and take up the new position, in anticipation of which he was on 26 January 1946 appointed Knight Grand Cross of the Order of Saint Michael and Saint George and created Viscount Alexander of Tunis, of Errigal in the County of Donegal on 1 March. On 21 March 1946, the commission under the royal sign-manual and signet appointing Alexander was issued. Alexander was subsequently sworn-in during a ceremony in the Senate chamber on 12 April that year. Alexander took his duties as the viceroy quite seriously, feeling that, as governor general, he acted as a connection between Canadians and their King, and spent considerable time traveling Canada during his term; he eventually logged no less than 294,500 km (184,000 mi) during his five years as governor general. On these trips, he sought to engage with Canadians through various ceremonies and events; he was keenly interested in his role as Chief Scout of Canada and, in preparation for his kicking of the opening ball in the 1946 Grey Cup final, practised frequently on the grounds of the royal and viceregal residence, Rideau Hall. Also, in commemoration of Alexander being named the first non-aboriginal chief of the Kwakiutl tribe, he was given a totem pole on 13 July 1946; crafted by Mungo Martin, it remains on the grounds of Rideau Hall today. By the end of the year, Alexander was also distinguished with his induction as a Knight of the Order of the Garter. In 1947, the King issued letters patent granting his Canadian governor general permission to exercise all those powers belonging to the monarch in respect of Canada and, at the Commonwealth Prime Ministers Conference of 1949, the decision was reached to use the term member of the Commonwealth instead of Dominion to refer to the non-British member states of the Commonwealth of Nations. That same year, Alexander oversaw the admission of the British crown colony of Newfoundland into Canadian Confederation and toured the new province that summer. Then, during a later visit to Alberta, the Governor General was admitted to the Blackfoot tribe as Chief Eagle Head. However, though the post-war period saw a boom in prosperity for Canada, the country was again at war by 1950, with Alexander, in his role as acting commander-in-chief, deploying to the Korean War soldiers, sailors, and airmen, whom he would visit prior to their departure for north-east Asia. The Viscount travelled abroad on official trips—in 1947 visiting US president Harry S. Truman and in June 1948 Brazilian president Eurico Gaspar Dutra—as well as hosting a number of dignitaries. The visit of the Irish Taoiseach, John A. Costello, in 1948 caused Alexander some embarrassment when Costello chose the occasion to announce that most of Ireland were leaving the Commonwealth (Northern Ireland would remain a constituent part of the United Kingdom). Although the decision had been taken in principle sometime before, the sudden announcement caused a diplomatic storm and Costello, to deflect criticism, claimed that he had been provoked into making the announcement by a series of diplomatic snubs by Lord Alexander. In his memoirs, Costello was to admit that Alexander's behaviour had in fact been perfectly civil and could have had no bearing on a decision which had already been made to declare the Republic of Ireland. The Alexanders' relatively informal lifestyle at Rideau Hall was demonstrated when, during the Canadian tour of Princess Elizabeth and her husband, the Duke of Edinburgh, the Viscount and Viscountess hosted a square dance in the palace's ballroom. Alexander painted (creating a personal studio in the former dairy at Rideau Hall and mounting classes in art at the National Gallery of Canada), partook in a number of sports (including golf, ice hockey, and rugby), and enjoyed the outdoors, particularly during Ontario and Quebec's maple syrup harvest, himself overseeing the process on Rideau Hall's grounds. The Viscount was known to escape from official duties to partake in his most favourite pastime of fishing, once departing from the 1951 royal tour of Princess Elizabeth to take in a day's fishing at Griffin Island, in Georgian Bay, and granting a day off for students in the town of Drayton, Ontario, where his train briefly stopped. Among Canadians, Alexander proved to be a popular viceroy, despite the calls for a Canadian-born governor general that had preceded his appointment. Not only did he have a much praised military reputation—he was considered to be the best military strategist since the 1st Duke of Wellington—but he was also a charismatic figure with an easy ability to communicate with people. Others, however, did not fully approve of Alexander; editor Hugh Templin, from Fergus, Ontario, met with Alexander during Templin's time as a special correspondent with the Canadian Press during the Second World War, and he said of the encounter: "Lord Alexander impressed us considerably, if not too favourably. He was an aristocratic type, who didn't like newspaper men." 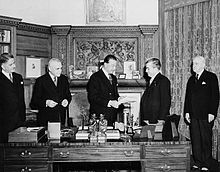 Lord Alexander departed the office of Governor General of Canada in early 1952 after Churchill asked him to return to London to take the post of Minister of Defence in the British government. The aging Churchill had found it increasingly difficult to cope with holding that portfolio concurrently with that of prime minister, although he still took many major decisions himself, leaving Alexander with little real power. Soon after, George VI died on the night of 5–6 February and Alexander, in respect of the King's mourning, departed quietly for the United Kingdom, leaving Chief Justice of Canada Thibaudeau Rinfret as administrator of the government in his place. After his return to the UK, Alexander was on 14 March 1952 elevated in the peerage by the new queen, becoming Earl Alexander of Tunis, Baron Rideau of Ottawa and Castle Derg. He was also appointed to the organising committee for the Queen's coronation and was charged with carrying the Sovereign's Orb in the state procession on that occasion in 1953. The Earl served as the British defence minister until 1954, when he retired from politics and, in 1959, the Queen appointed Alexander to the Order of Merit. From 1960 to 1965, he served as Constable of the Tower of London. Alexander was an active freemason. Canada remained a favourite second home for the Alexanders and they returned frequently to visit family and friends until Alexander died on 16 June 1969 of a perforated aorta. His funeral was held on 24 June 1969, at St. George's Chapel, in Windsor Castle, and his remains are buried in the churchyard of Ridge, near Tyttenhanger, his family's Hertfordshire home. Arms of The Earl Alexander of Tunis: Per pale argent and sable a chevron and in base a crescent all counterchanged on a canton azure a harp or stringed argent. Alexander, Harold (3 February 1948). "The African Campaign from El Alamein to Tunis, from 10 August 1942 to 13 May 1943". London Gazette. London: King's Printer (Supplement 38196): 839–887. Retrieved 22 March 2009. Alexander, Harold (10 February 1948). "Conquest of Sicily 10 July 1943 to 17 August 1943". London Gazette. London: King's Printer (Supplement 38205): 1009–1025. Retrieved 22 March 2009. Alexander, Harold (6 June 1950). "The Allied Armies in Italy, from 3 September 1943 to 12 December 1944". London Gazette. London: King's Printer (Supplement 38937): 2879–2975. Retrieved 22 March 2009. ^ British diplomat David Hunt, who, during the Second World War, served as an intelligence officer in Greece, North Africa and Italy, and who after the war was a member of the British Committee of Historians of the Second World War, wrote in his war memoirs of Alexander's "brilliant grasp of manoeuvre and deception" and "very sound understanding of the realities of military supply and administration". He also noted that Alexander was, by the almost universal judgement of "men of experience in senior stations", the "foremost British commander of the war". This was, to his personal knowledge, the case with three British prime ministers: Clement Attlee, Winston Churchill and Harold Macmillan. Hunt also quotes Omar Bradley as writing "He not only showed the shrewd tactical judgement that was to make him the outstanding general's general of the European war but was easily able to comport the nationally-minded and jealous Allied personalities of his command. In each successive Mediterranean campaign he had won the adulation of his American subordinates". ^ The other figures present are (left to right) Leader of the Government in the Senate Wishart McLea Robertson, Prime Minister Louis St. Laurent, Speaker of the House of Commons Gaspard Fauteux and Speaker of the Senate James Horace King. ^ It was on 16 September 1946 that the Canadian priory of the Order of Saint John was created, and Alexander became the first prior and chief officer in Canada. He relinquished this status on 28 February 1952 to his viceregal successor, thus returning to holding solely the rank of knight of justice in the British priory of the order. ^ a b Houterman, Hans; Koppes, Jeroen. "World War II unit histories and officers". Retrieved 19 June 2008. ^ Privy Council Office (30 October 2008). "Historical Alphabetical List since 1867 of Members of the Queen's Privy Council for Canada". Queen's Printer for Canada. Retrieved 20 March 2009. ^ Williamson, Martin (9 April 2005). "Fowler's Match". Cricinfo Magazine. London: Entertainment and Sports Programming Network. Retrieved 21 March 2009. ^ Graham & Bidwell 1986, p. 34. ^ "No. 28533". The London Gazette. 22 September 1911. p. 6950. ^ "No. 28688". The London Gazette. 7 February 1913. p. 961. ^ "No. 29160". The London Gazette (Supplement). 12 May 1915. p. 4625. ^ a b "No. 29438". The London Gazette (Supplement). 14 January 1916. p. 576. ^ a b c "No. 29793". The London Gazette (Supplement). 20 October 1916. p. 10169. ^ a b c d e f g h i Office of the Governor General of Canada. "Governor General > Former Governors General > Field Marshal the Earl Alexander of Tunis". Queen's Printer for Canada. Archived from the original on 9 October 2006. Retrieved 20 March 2009. ^ "No. 30027". The London Gazette. 17 April 1917. p. 3738. ^ "No. 30179". The London Gazette. 10 July 1917. p. 6971. ^ "No. 30253". The London Gazette (Supplement). 24 August 1917. p. 8860. ^ "No. 30385". The London Gazette. 16 November 1917. p. 11905. ^ "No. 31048". The London Gazette. 3 December 1918. p. 14396. ^ Kipling, Rudyard. "The Irish Guards in the Great War, Vol. 2". Archived from the original on 7 April 2014. Retrieved 11 May 2013. ^ "No. 31958". The London Gazette. 29 June 1920. p. 7072. ^ "No. 32702". The London Gazette (Supplement). 16 May 1922. p. 3854. ^ "No. 33126". The London Gazette. 22 January 1926. p. 536. ^ "No. 33356". The London Gazette. 14 February 1928. p. 1050. ^ "No. 33371". The London Gazette. 30 March 1928. p. 2341. ^ "No. 33572". The London Gazette. 21 January 1930. p. 427. ^ "No. 33573". The London Gazette. 24 January 1930. p. 500. ^ "No. 33687". The London Gazette. 6 February 1931. p. 832. ^ "No. 33806". The London Gazette. 8 March 1932. p. 1605. ^ "No. 34123". The London Gazette. 11 January 1935. p. 301. ^ "No. 34112". The London Gazette. 7 December 1934. p. 7929. ^ a b "No. 34253". The London Gazette. 7 February 1936. p. 811. ^ a b "No. 34253". The London Gazette. 7 February 1936. p. 818. ^ a b "No. 34264". The London Gazette. 13 March 1937. p. 1657. ^ "No. 34453". The London Gazette (Supplement). 9 November 1937. p. 7034. ^ Renzetti, Elizabeth (26 December 2008). "'Vulnerability brings us together'". The Globe and Mail. Archived from the original on 16 January 2009. Retrieved 17 March 2009. ^ a b "No. 34414". The London Gazette. 2 July 1937. p. 4254. ^ "No. 34492". The London Gazette. 11 March 1938. p. 1673. ^ "No. 34487". The London Gazette. 25 February 1938. p. 1261. ^ a b "No. 34518". The London Gazette (Supplement). 7 June 1938. p. 3688. ^ "After the Auk". Time Magazine. No. 31 August 1942. 31 August 1942. Retrieved 1 March 2008. ^ Bradley 1951, p. 182. ^ a b "No. 35020". The London Gazette. 20 December 1940. p. 7175. ^ "No. 34899". The London Gazette (Supplement). 16 July 1940. p. 4415. ^ a b "No. 35503". The London Gazette. 27 March 1942. p. 1399. ^ a b "No. 35399". The London Gazette. 1 January 1942. p. 3. ^ "No. 35509". The London Gazette (Supplement). 31 March 1942. p. 1497. ^ Borth, Christy. Masters of Mass Production, pp.218–9, Bobbs-Merrill Company, Indianapolis, IN, 1945. ^ a b "No. 35763". The London Gazette (Supplement). 27 October 1942. p. 4689. ^ "No. 36822". The London Gazette (Supplement). 1 December 1944. p. 5551. ^ "No. 37407". The London Gazette (Supplement). 28 December 1945. p. 1. ^ Hunt 1990, pp. xxiv, xxv. ^ Hunt 1990, pp. xxv, xxvi. ^ a b c "No. 37453". The London Gazette. 1 February 1946. p. 767. ^ "No. 37491". The London Gazette. 5 March 1946. p. 1241. ^ "Canada Gazette, volume 80, number 16". 20 April 1946. p. 2431. Retrieved 19 April 2017. ^ a b "No. 37807". The London Gazette (Supplement). 3 December 1946. p. 5945. ^ McCullagh, David (2010). Reluctant Taoiseach. Gill and Macmillan. pp. 207–212. ^ a b c Thorning, Stephen. "Valuing Our History". The Wellington Adviser. Retrieved 26 March 2009. ^ "No. 39491". The London Gazette. 14 March 1952. p. 1468. ^ "No. 39569". The London Gazette. 10 June 1952. p. 3184. ^ "No. 40020". The London Gazette (Supplement). 17 November 1953. p. 6243. ^ a b "No. 42110". The London Gazette. 5 August 1960. p. 5372. ^ "Harold Alexander, 1st Earl Alexander of Tunis is born". Masonry Today. 10 December 2015. ^ a b c d Office of the Governor General of Canada. 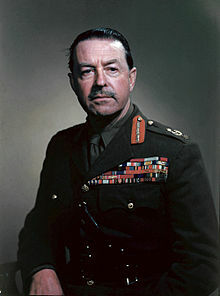 "Field Marshal the Earl Alexander of Tunis". Queen's Printer for Canada. Retrieved 11 May 2013. ^ "Saint John Ambulance > About Us > The Order of St. John > The Order of St. John in Canada". St. John Ambulance Canada. Retrieved 7 April 2009. ^ "No. 41998". The London Gazette. 1 April 1960. p. 2365. ^ "No. 44450". The London Gazette. 14 November 1967. p. 12347. ^ "Deputy Chief Scout will visit Gibsons". Coast News. 28 January 1960. Retrieved 11 May 2013. ^ "Canada: Dominion High Commissioners; use of suffix 'PC (Can)' (member of the Canadian Privy Council) and title 'Right Honorable'". Records of the Privy Council and other records collected by the Privy Council Office. The National Archives. Retrieved 3 June 2012. ^ "No. 39566". The London Gazette. 6 June 1952. p. 3166. ^ "No. 41072". The London Gazette. 17 May 1957. p. 2934. ^ "No. 43616". The London Gazette. 2 April 1965. p. 3297. ^ "No. 29890". The London Gazette (Supplement). 2 January 1917. p. 219. ^ a b c d "Harold Alexander, 1st Earl Alexander of Tunis". World War II Unit Histories & officers. Retrieved 11 May 2013. ^ "FM Lord Alexander Receives City Freedom". British Pathé. 1946. Retrieved 6 January 2016. ^ Canadian Press (12 March 1946). "Daily Visits To Canada House In London Paid By Viscount Alexander". Ottawa Citizen. Retrieved 6 January 2016. ^ "No. 36125". The London Gazette (Supplement). 6 August 1943. p. 3579. ^ "No. 36398". The London Gazette (Supplement). 25 February 1944. p. 985. ^ "No. 34456". The London Gazette. 19 November 1937. p. 7263. ^ "No. 36616". The London Gazette (Supplement). 18 July 1944. p. 3379. ^ "No. 37673". The London Gazette (Supplement). 30 July 1946. p. 3927. ^ "No. 37739". The London Gazette (Supplement). 27 September 1946. p. 4842. ^ "No. 38829". The London Gazette (Supplement). 3 February 1950. p. 590. ^ "No. 39316". The London Gazette (Supplement). 24 August 1951. p. 4487. ^ "Honorary degrees" (PDF). McGill University. Retrieved 1 March 2017. ^ "Honorary degrees" (PDF). Queen's University. Retrieved 1 March 2017. ^ "The Degree of Doctor of Laws (honoris causa) Conferred at Congregation, October 31st, 1945". University of British Columbia. Retrieved 6 January 2016. ^ University of California, Berkeley (1950). "Register – University of California". University of California Press. p. 67. Retrieved 6 January 2016. ^ "Honorary degrees" (PDF). Nottingham University. Retrieved 1 March 2017. ^ Department of National Defence (16 March 2008). "Viscount Alexander Public School". National Inventory of Military Memorials. Queen's Printer for Canada. Archived from the original on 21 May 2014. Retrieved 21 May 2014. Molony, C.J.C. ; with Flynn, F.C. ; Davies, H.L. & Gleave, T.P. (2004) [1st. pub. HMSO 1973]. Butler, J.R.M, ed. The Mediterranean and Middle East, Volume V: The Campaign in Sicily 1943 and The Campaign in Italy 3rd September 1943 to 31st March 1944. History of the Second World War United Kingdom Military Series. Uckfield, UK: Naval & Military Press. ISBN 1-84574-069-6. Playfair, I.S.O. ; Flynn, F.C. ; Molony, C.J.C. & Gleave, T.P. (2004) [1st. pub. HMSO 1960]. Butler, J.R.M, ed. The Mediterranean and Middle East, Volume III: British Fortunes reach their Lowest Ebb (September 1941 to September 1942). History of the Second World War United Kingdom Military Series. Naval & Military Press. ISBN 1-84574-067-X. Playfair, I.S.O. ; Molony, C.J.C. ; Flynn, F.C. & Gleave, T.P. (2004) [1st. pub. HMSO 1966]. Butler, J.R.M, ed. The Mediterranean and Middle East, Volume IV: The Destruction of the Axis Forces in Africa. History of the Second World War United Kingdom Military Series. Uckfield, UK: Naval & Military Press. ISBN 1-84574-068-8. Wilson, John S. (1959). Scouting Round the World (1st ed.). Poole: Blandford Press. OCLC 58863729. Wikimedia Commons has media related to Harold Alexander, 1st Earl Alexander of Tunis.